Though the first two installments of the Thor franchise aren't exactly regarded as the best films that Marvel Studios has released so far, fans love the character. By the looks of things, the upcoming Thor: Ragnarok could easily be the best yet, and it just got better. We already knew that Mark Ruffalo would be joining Chris Hemsworth as the Hulk, but Marvel just announced two brand new additions to the already stacked cast. Jeff Goldblum of Independence Day fame and Karl Urban of Dredd and Star Trek fame have both been added to the cast of the upcoming film in villain roles. Marvel made the announcement on Friday, saying that Jeff Goldblum will be playing the villain Grandmaster and that Karl Urban will be playing Skurge. In the announcement, the studio also firmed up and reaffirmed some already released casting with Cate Blanchett playing the film's main villain Hela and Creed star Tessa Thompson's mysterious role revealed to be Valkyrie. The announcement came with a statement from Marvel Studios president Kevin Feige, who praised the talent they've managed to wrangle for the film. "The continuation of the epic Thor franchise will be powerful and unique, and with the additions of Cate, Jeff, Tessa, Karl, and Mark to the cast we have the makings of his most dangerous and heroic adventure yet. The sheer, raw talent each of these actors brings to the screen can't be quantified. Having any one of them join the Marvel Cinematic Universe would be an honor, and having all of them is incredible." While Urban comes as a complete, out of the blue but welcomed surprise addition to the Marvel Universe, Goldblum may be somewhat less surprising. While out doing press for his new film Independence Day: Resurgence, he had hinted that he might be flirting with a superhero role when the subject came up about him wanting to do one or not. "I can say very little right now, but you might be onto something," the actor told MTV News. As it turns out, they definitely were onto something, and something pretty big as those who know their Marvel Comics history will tell you. Grandmaster is an ancient being with an unknown backstory who was created by comic legends Roy Thomas and John Buscema, with the character making his first appearance in Avengers #69. The character is a master of all games of skill and chance and is a member of the Elders of the Universe. It is also very important to note that in the comics the character once possessed the Mind Gem, so Goldblum could easily be our link to one of those missing Infinity Stones. Urban's Skurge, on the other hand, is an Asgardian who has been a long time villain of Thor and was actually involved in the Ragnarok storyline from the comics. It is also important to note that Skurge is a member of the Masters of Evil superteam, so Marvel could be looking to build to something in the future with that. In addition to these new casting announcements, everyone's favorite Marvel bad guy Loki will be back and it is rumored this may be Tom Hiddleston's last go round as the trickster god. It was also recently confirmed that Natalie Portman would not be returning as Jane Foster for the third installment of the Thor franchise. Thor: Ragnarok is set to hit theaters November 3, 2017 and is being helmed by What We Do In The Shadows director Taika Waititi. 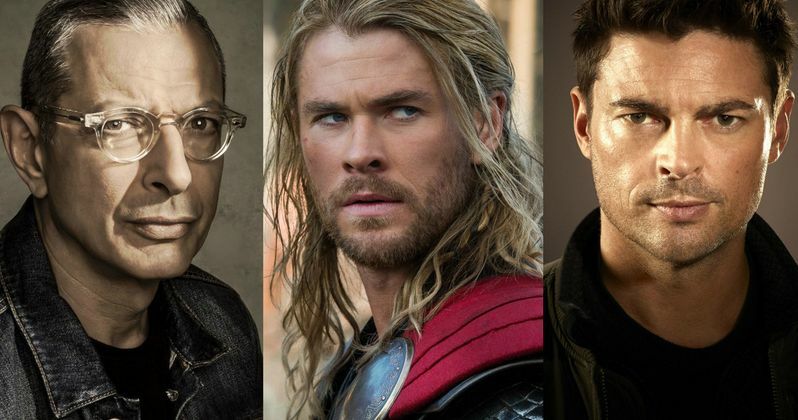 Are you excited about Jeff Goldblum and Karl Urban joining the MCU?